Several years ago, my wife and I temporarily moved to another state for 10 months. One of the biggest pains of the entire process was having to pack and store large amounts of our stuff and then retrieve it when we moved back. We had to throw everything in boxes, load the boxes into pickup trucks, transport the boxes to the storage units, unload the boxes, and then do it all again, in reverse. We’re not even close to the only ones who have had to go through that experience. Every day someone is going through that pain, and that’s what makes Clutter seem like such an attractive concept. The company, which recently raised $9 million in Series A funding, is an end-to-end solution for all things self-storage. When you need items – of any kind – to be stored, the company sends movers and a truck to pack them up for you, load them onto the truck, and then transport them to a storage unit. Nice features, but not all that different from any other moving company. So what sets Clutter apart from traditional self-storage? First, the company doesn’t own any of their own storage space. They are able to cut costs dramatically by leasing small amounts of space from other companies and then passing those savings directly onto the customers; prices are monthly and start as low as $7 per month. If necessary, the company will add its own climate control units to the rental spots. On top of that, as the items are being packed, they are photographed. The photographs are then uploaded to a database which you can access from anywhere. Each of the items is also given a unique barcode (and saved within basic groupings like Kitchen Supplies or Tools). When you want one of your items from storage, you simply select it from your online portal and request its delivery. It’ll get to you within 48 hours. The pain of packing, moving, and retrieving is essentially eliminated by Clutter. Clutter also eliminates the frustration of having to remember exactly what you packed in storage. Clutter is entering a market that is currently open for the taking. The self-storage market is a $22 billion dollar behemoth, and with Millennials becoming increasingly mobile, the need for storage is greater than ever. Companies like Make Space and Fetch Storage have also entered the “Do-It-For-You” storage market, offering services very similar to Clutter. Some companies like Roost have followed the AirBnB model, allowing you to rent out other people’s vacant storage space, but let’s be real; finding somewhere to put the stuff is not what everyone dreads. Two things seem to differentiate Clutter from the competitors. First, Clutter is able to offer their services at a lower price due to their low overhead. Second, Clutter, unlike many of its competitors, doesn’t use the “box” pricing model, where price is determined by whether the items can fit into a box. Your life doesn’t fit in a box. The hard thing to do is to move an eight-piece sectional couch or a marble table. We pride ourselves on not necessarily doing what’s easiest for us, but with the goal of what’s the most convenient service for the customer. 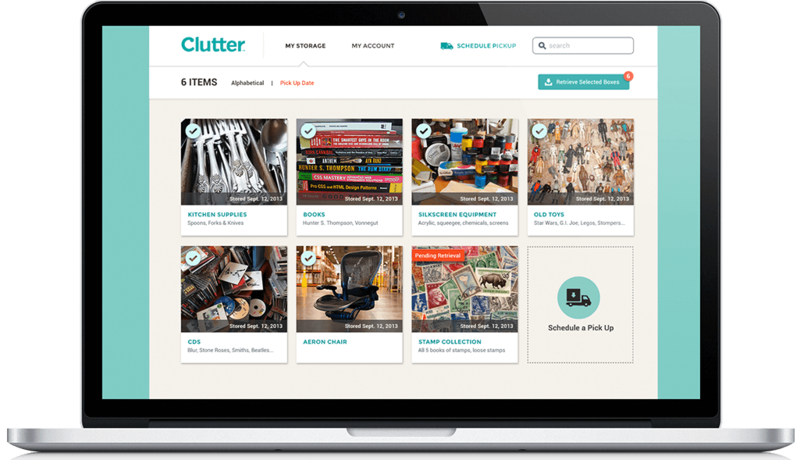 Currently Clutter is available in Los Angeles, New York City, San Francisco, Orange County, and Ventura County. The service industry is not going to go away and if I have seen at least 1 moving truck business this month I have seen 4. There is plenty of room in the niche for other businesses and at some point they are all busy, so that leaves room for another. I like how modern this one feels. Great post!